Vascular Biology of the Placenta. San Rafael (CA): Morgan & Claypool Life Sciences; 2010. The human placenta and cord blood are rich in hematopoietic progenitor and hematopoietic stem cells (HSCs), which give rise to all the blood cell types including myeloid (monocytes and macrophages, neutrophils, basophils, eosinophils, erythrocytes, megakaryocytes/platelets, and dendritic cells) and lymphoid lineage (T-cells, B-cells, and NK cells) cells. Since the first successful umbilical cord blood transplants in children with Fanconi anemia , cord blood banking and the therapeutic use of cord blood stem cells have grown quickly in the last two decades. Like stem cells from bone marrow, umbilical cord blood hematopoietic stem cells have been used to treat various genetic disorders including leukemia, certain cancers, and some inherited disorders [200–202]. In addition to hematopoietic progenitors and HSCs, the placenta also enriches mesenchymal stem cells (MSCs). MSCs have a broad differentiation potential . MSCs from fetal membranes and placental tissue are able to differentiate in vitro into multiple lineage cell types including osteoblasts, chondrocytes, myocytes, adipocytes, and endothelial cells [203–207]. Recent animal studies also showed that MSCs could be differentiated into beta-pancreatic islet cells and MSCs administration result in beta-pancreatic islet regeneration and prevent renal damage in diabetic animals [208,209]. Table 10.1 shows a list of differentiation potential of human placenta and amniotic fluid mesenchymal stem cells. Mesenchymal stem cells are well tolerated by the host and can therefore avoid allorecognition. They interfere with dendritic cells and T-cells. Theses cells are able to secrete cytokines and generate a local immunosuppressive microenvironment . Differentiation potential of human placenta and amniotic fluid mesenchymal stem cells. Placental MSCs are easily accessible with more primitive molecular characteristics. They are amplifiable in vitro. The multiple-lineage differentiation potential of placental MSCs presents an invaluable future for clinical applications. To date, MSCs have been successfully isolated from human placental villous tissue, amniotic fluid, and fetal membrane. They offer a renewable source of cell replacement for antiaging therapy, regeneration medicine, and are used to treat various neurological and immune disorders. 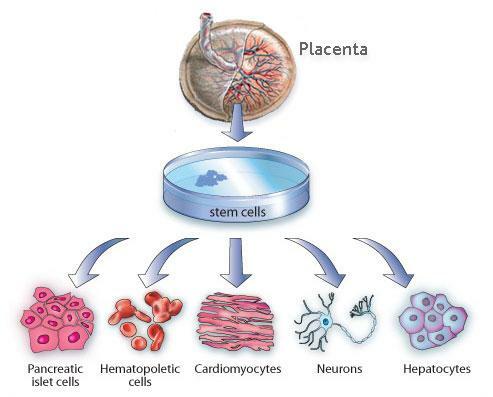 Placental stem cell therapy will be a promising answer for many of today’s untreatable diseases in the years to come. Copyright © 2010 by Morgan & Claypool Life Sciences.